Definition at line 17 of file dce.h. Definition at line 28 of file dce.h. Referenced by DceAllocDCE(), DceDeleteClipRgn(), DceFreeDCE(), DceFreeThreadDCE(), DceFreeWindowDCE(), DceReleaseDC(), DceResetActiveDCEs(), DceUpdateVisRgn(), IntWindowFromDC(), UserGetDCEx(), and UserReleaseDC(). Definition at line 20 of file dce.h. Referenced by DceAllocDCE(), DceDeleteClipRgn(), DceFreeDCE(), DceFreeWindowDCE(), DceGetDceFromDC(), DceReleaseDC(), DceResetActiveDCEs(), DceUpdateVisRgn(), IntWindowFromDC(), UserGetDCEx(), and UserReleaseDC(). Definition at line 25 of file dce.h. Referenced by DceAllocDCE(), DceDeleteClipRgn(), DceFreeDCE(), DceResetActiveDCEs(), DceUpdateVisRgn(), and UserGetDCEx(). Definition at line 26 of file dce.h. Definition at line 27 of file dce.h. Definition at line 21 of file dce.h. Referenced by DceAllocDCE(), DceFreeWindowDCE(), DceReleaseDC(), DceResetActiveDCEs(), IntWindowFromDC(), and UserGetDCEx(). Definition at line 19 of file dce.h. Referenced by DceAllocDCE(), DceFreeDCE(), and UserGetDCEx(). Definition at line 31 of file dce.h. Definition at line 30 of file dce.h. Referenced by DceAllocDCE(), DceReleaseDC(), and UserGetDCEx(). Definition at line 29 of file dce.h. 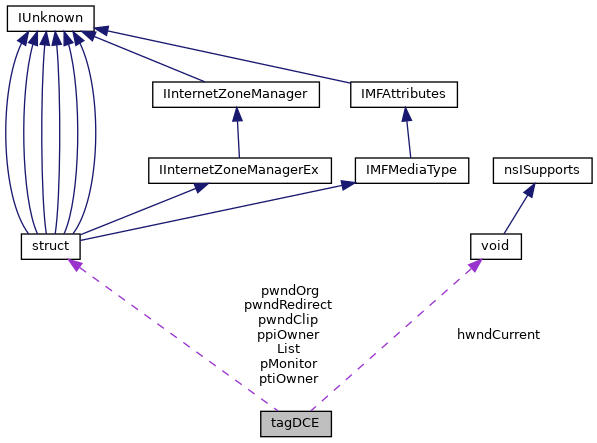 Referenced by DceAllocDCE(), DceFreeThreadDCE(), DceReleaseDC(), and UserGetDCEx(). Definition at line 23 of file dce.h. Referenced by DceAllocDCE(), DceFreeWindowDCE(), DceReleaseDC(), and UserGetDCEx(). Definition at line 22 of file dce.h. Definition at line 24 of file dce.h.